Running a business by design has risks. Depending on the scale, the outcome from risk has the potential to ripple from only a minor setback to a major disruption. Companies are always seeking solutions to minimize the chance of an impact on the bottom line. It is no different for supply chain organizations. Some industry risks include physically and environmentally damaged shipments, lost or stolen shipments and late arrivals. And cold chain cargo is required to meet federal regulations as well as the industry’s many good distribution practices. Failing to comply with the laws and guidelines leaves you open to the risk of fines or a temporary halt in operations until the issue is fixed. The New How of logistics is about staying connected with your shipments in real-time from origin to destination so you can adapt to situations as they arise. • Identifying trends on carriers, routes, modal mix, etc. Smart sensors placed on pallets or packages transmit data at customizable business-defined intervals. This information flow provides the necessary visibility to reduce risk. By knowing the location, you are able to adjust delivery arrivals, production schedules and more. With data on environmental conditions (e.g., temperature, humidity, light, movement and shock), you know that the product has stayed in compliance and should be at the optimal quality for further processing or retail. If unexpected changes occur, supply chain risk typically increases. For example, political volatility or natural disasters may cause missed connections between modes, such as truck to ship, or damage to the shipment. Alert notifications are triggered when these exceptions happen or a condition threshold is exceeded. For example, one company might have saved their medicinal shipment from mold if they had only known about the high humidity and warm temperatures their product was exposed to in-transit. After moving to CalAmp’s Supply Chain Integrity services, they were able to monitor shipment temperatures with smart sensors as well as assure carrier performance and prevent loss due to a quality compromise. There have been no lost shipments due to mold or other quality issues since the solution was adopted. Another company was regularly experiencing the theft of their raw material cargo. They implemented an IoT solution to keep them informed of shipment locations. As a result, the company eliminated cargo theft from truck diversions due to access to real-time data and alerts. Even verifying drivers is important as thieves often pick-up cargo using false identification. They take advantage of a hectic situation in the yard or port. The right information either helps ensure it is the correct person or records the information, such as the driver’s photo, for aid in the recovery. Data analysis over time offers trend insights into the best modes, carriers, routes and more to optimize your logistics. Evaluating your supply chain performance helps make your operations more efficient and reduce your exposure to risk. 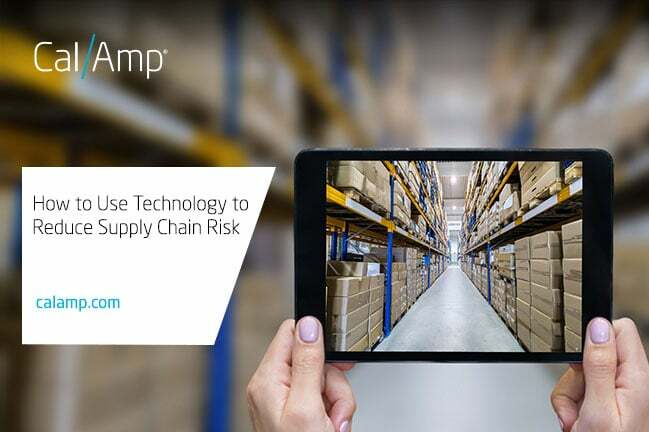 If you are interested in implementing technology in your supply chain, please visit our page at calamp.com/solutions/supply-chain-management for more information.